I confess I was not riding the bacon bandwagon. It wasn’t that I disliked bacon; I just didn’t think it was a necessity of life. But my experience had been limited to preservative-laden, shrink-wrapped supermarket bacon. I hadn’t had locally smoked bacon from an organic pig. Our Pig, for instance. Our Pig’s bacon is thick-cut and not on the lean side, to put it politely. Those heftier slices are less inclined to curl up when they cook. This means perfectly cooked bacon — no burned bits, no raw spots. Much of the fat melts out as they sizzle. That fat now resides in a dish in my fridge. If you’re a regular reader, you know I try to make healthy food around here. Moderation is key; I can’t claim that all my recipes are low-fat, high-fiber, sugar-free paragons of virtue. I do aim for a rational balance of flavor and nutrition. What that means is that bacon, even the world’s best bacon, is going to be a Best Supporting Actor and not the lead in any dish I make. But that’s the thing about bacon: it has so much flavor that a small amount will make itself know in the best possible way. The acid of the tomatoes balances the fatty, porky goodness of the bacon. If you have access to great fresh tomatoes, use them. Otherwise, there’s a wide selection of terrific canned tomatoes out there. I used arugula for the L in the BLT, for the smoky, herbal hit. Fresh spinach would also be wonderful, especially if you’re not an arugula fan. 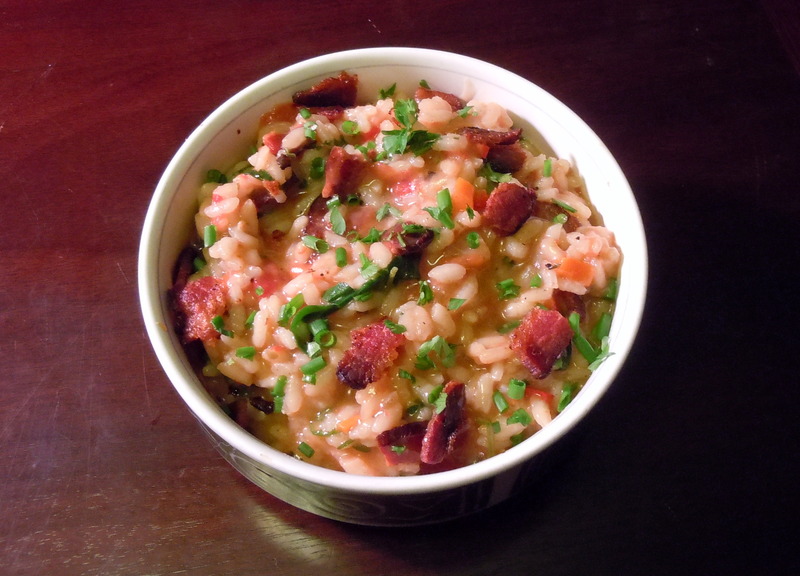 The tender leaves of both arugula and baby spinach can be cooked directly in the risotto. If you choose to use a heartier green, such as kale, you should blanch it first. In a large skillet over medium heat, cook the bacon until it’s crisp. While the bacon cooks, warm the chicken stock over medium heat in a saucepan. Remove the bacon to paper towels to drain. Pour out all but 1 tbs. of the bacon fat. Add the butter to the pan along with the onion, carrot, and garlic. Cook for 2-3 minutes until softened. Add the rice and cook for 4 minutes longer until the rice is translucent and the veg are lightly browned. Add the wine and a ladleful of stock (about ½ cup). Stir while the liquid is absorbed. Continue to add ladlefuls of stock to keep the consistency soupy. Taste and adjust the seasoning with salt and pepper. After about 10 minutes, add the tomatoes. Continue adding stock until the rice has softened and swelled, but still has a slight bite. Stir in the arugula and cook for a few minutes longer, until the arugula has wilted and the rice is tender. 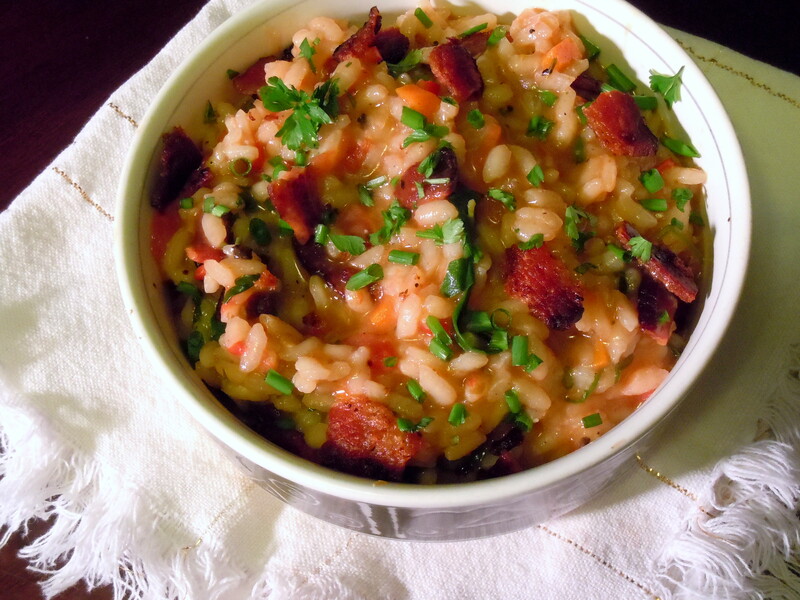 Add enough stock so that the risotto is creamy and slightly runny. Stir in the cheese, if using, and the parsley. Serve immediately. This entry was posted in main courses, pasta, rice, and grains, sides and tagged arugula, bacon, casserole, rice, risotto, spinach, tomatoes. Bookmark the permalink. That’s the joy of arborio rice; all that starch turns the stock into creamy goodness without any actual cream or even butter, in this case.